The egg…..in all its glory…..the perfect little protein punch!! Most eggs average 7 g of protein each and I aim for about 20 g at breakfast time. So this am I made 3 baked eggs in muffin tins just to test this idea out. 3. Bake for 15 min. Enjoy!! I know we all need constant inspiration and new ideas to keep going on the healthy train so I hope you will try this and love it! 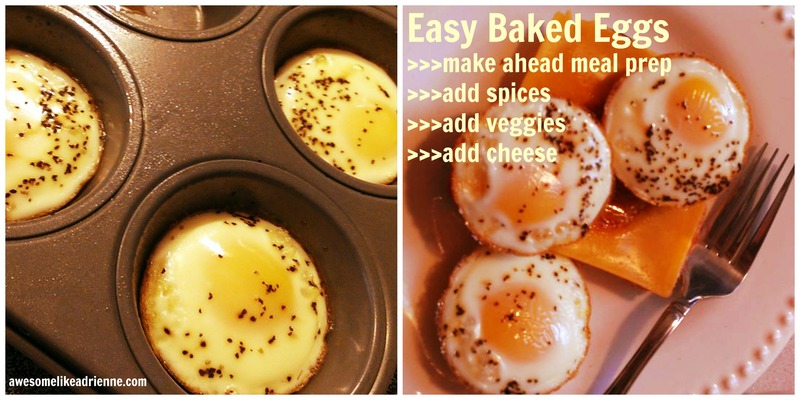 Posted on November 13, 2014 November 11, 2014 by awesomelikeadriennePosted in HOMETagged baked eggs, breakfast, eggs, fast, healthy, meal prep, muffin tins, protein. Sounds wonderful. I will try this. Thanks.